100% Cotton Diaper Bags that are stylish and functional too! Customers also like these as handbags, so we've added an option for a discounted price when purchasing without the changing pad and diapering accessories. Each loveybag has a front pocket with a snap closure, two side pockets that can hold baby bottles or water bottles, and inner pockets sized to fit the changing pad, wipes, a tube of diaper ointment, and diapers. These pockets are also versatile when using a loveybag as a handbag. Loveybags come with a coordinating changing pad, a tube of Hemp Baby Salve, and a 12 in. x 12 in. ALOKSAK wetbag for holding wet diapers. 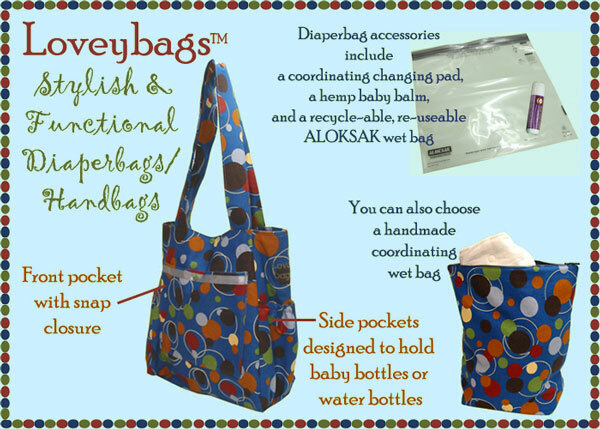 ALOKSAK wet bags are made in the U.S.A. and are re-useable and recycleable. You can also choose to upgrade to a handmade coordinating wetbag. Our handmade wet bags are 12 in. x 15 in. and are made with an inner layer of waterproof PUL, an outer of the coordinating cotton print, and a zipper closure. You can also choose to purchase your loveybag as a handbag without these accessories, and the price will be discounted. The dimensions of our loveybags are: 13" wide by 15" tall by 8" deep. Please click below to view our current selection.